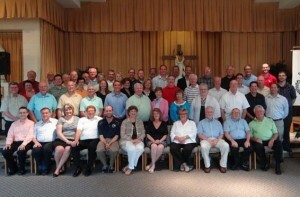 Following a year of preparation and a series of area meetings, 51 delegates attended the second Midwest District Mission Congress on the campus of Lewis University in Romeoville, IL, July 16-19. The Congress, which sets the District’s strategic direction for the coming years, opened with a keynote presentation by General Councilor Brother Robert Schieler. With a theme of “Called to Transform Lives,” delegates gathered to discern what they could create, together and by association, that would lead to a transformation of the District. Working in four commissions, the delegates approved 18 resolutions in the areas of governance, finance, formation and association.